So says Robin Anderson of the elderly clients whom she hopes to aid through her recently-launched business, Anderson’s In-Home Services, Inc. The Tustin-based small business provides many services for its clients, including personal care (bathing, grooming and dressing), light housekeeping and laundry, meal preparation, companionship, transportation, errands/shopping service and assistance with doctor appointments. All services are performed by live-in or live-out caregivers, all of whom have been thoroughly vetted by Anderson via background checks, among other character verification. Anderson moved to southern California in 1981. She lived with her sister in Carlsbad at first, but moved to San Clemente the following year after she got married. 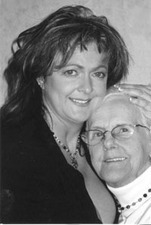 Then in 1983, Anderson’s mother, Florence Benson, joined her. Anderson, who had gotten a job with Costco in 1987, was delighted when her mom was hired as a “Demo Lady” by the company in 1994. Anderson reports that her mom’s gregarious demeanor quickly won her many friends, as well as a fair share of awards for her work performance. It was her mom’s death, Anderson reveals, that first got her thinking about starting her own in-home elderly care services business. The process took some time, she reports. Now, three years later, with, thus far, four clients and four caregivers, Anderson has no doubts about the wisdom of her decision. Anderson says that even though she is helping others, her mom is always in the forefront of her mind. And while she reports that she still works at Costco two days a week, Anderson believes she has found her life’s calling.